What did the five fingers say to the face? Schlapp! It is amazing how funny something can become when you spend a ton of time driving to and from basketball practices and games. My eldest and I found it hysterical a few years ago while driving on Schlapp Road while threatening each other that our five fingers would slap them. It is easy to see how others wouldn’t find this amusing but, in the moment and, even today, this is still funny to my daughter and I. We still drive past the road, bringing up the saying, still bringing a smile to my face, thinking back to those days gone by and all the good times, no matter how corny. My daughter recently told me that I should name a home brew Schlapp! How could I refuse. Formulating the recipe for Schlapp! I ran through some 30 bottles of home brew at a recent party, depleting any IPAs that I had laying around. I needed hops. Determining a good blend of hops seemed to be the toughest decision for this recipe. The 10 or so pounds of hops in the basement freezer provided a cornucopia of possibilities. I decided that I wanted to use what I had left of Hallterau Blank and Mandarina Bavaria with the touch of Belma. I have brewed with Hallertau Blanc and Mandarina Bavaria, with Mandarina providing a profile that I really like. I used the Belma to understand what the hop can add, making it the largest portion of the hopping schedule. Enjoy! 2017-06-04: Bottled with 3.50 ounces of priming sugar and 2.0 cups of water. 25, 22 ounce bottles. Bottle crown label: Sch. Useless Fact: Walt Disney created multiple fake companies (like M.T. Lott Real Estate) to buy Florida land in the 1960s. This let him acquire what is now Disney World while avoiding suspicion and keeping prices low. The stores on Main Street shop windows are the names of those original companies. 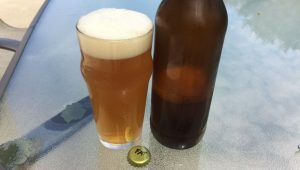 Tags: american double ipa, home brewing, schlapp! 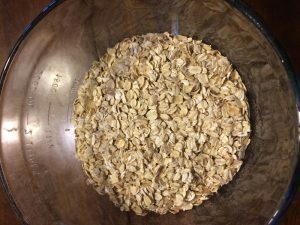 Posted in Beer, Beer Recipes, Home Brewing | Comments Off on Brewed: Schlapp! This is the first beer I have ever dedicated to a movie. I might have to come up with one for each of the main characters in the Hangover series. It gives me more reason to have to watch one, two or all three of the movies again. Nothing for me to balk at. Look: Pitch black. Opaque. Heaped helping of thick, tan foam covers. Froths as it recedes gently, leaving traces of past glory. Aroma: A pleasant balance of maltiness and hops. Sweet caramel with traces of chocolate and rye. Orange, grapefruit, and pineapple aromas from the hops. Not overly hopped but pleasant and easy on the nose. Taste: Like the nose, there is a good balance to the malt and hops. Generic base malt sweetness, chocolate and rye coexist. Orange and pineapple hops start in the middle, adding great balance and fullness to the beer. Minimal to no bitterness, possibly some from the touch of chocolate rye. Body: Medium body. Tending towards the high end of carbonation. Clean but not crisp. Dries. 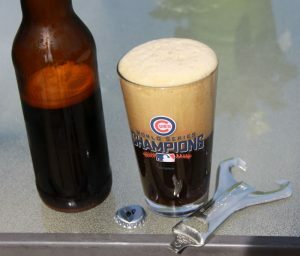 Overall: The most well balanced beer I brewed in a while, especially with the amount of hops used. Would brew this again without any changes. Solid beer. Cascadian dark ale or black ale, which ever you prefer to call it, seems to have been a fad. I brewed one, since I hadn’t had one in a long time to see if I could revive the dying breed. As I mentioned, I would brew it again, but when? Friends don’t want to take it so having to hit up five gallons on my own in a timely manner is almost impossible. Enjoy! Useless Fact: The poorest 5% of people in the U.S. are still richer than 68% of the world’s inhabitants. You are currently browsing the Sips blog archives for May, 2017.